cap is up to 10 cm broad, convex, white to creamy, dry, smooth. older specimens have a nearly flat cap. 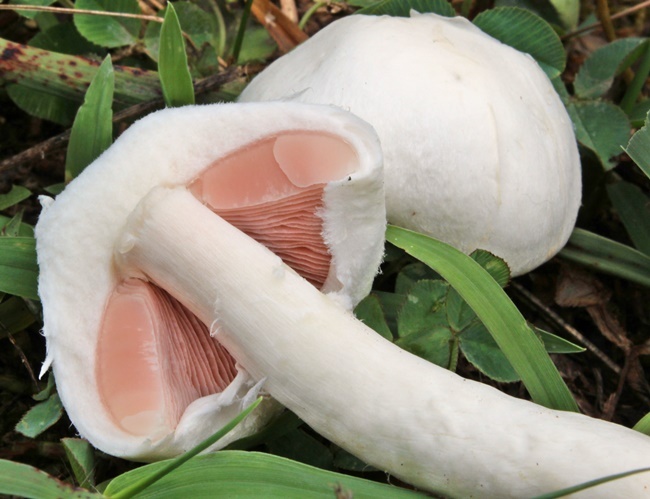 gills are crowded, free from the stem, progressing from bubble-gum pink to chocolate brown with age. partial veil is smooth, white, and leaves a single, thin ring on the stem. stem does not have a bulbous base. flesh slowly bruises off-white, to dingy brown, NOT staining yellow, orange or red. grows in grassy areas, meadows and fields, often in a ring. appears in spring, summer, or fall. taste is mild, odor is pleasant; cook before eating. warning: discard specimens that do not have the bubblegum-pink pink gills or who's flesh stains yellow, orange, or red; these can be poisonous look-alikes.